I found this recipe on Pinterest, and so far I've made it twice. In the last couple of weeks. It's that good! Not only is it good, but it's so easy to make. All you do is mix spices together - chili powder, cumin, garlic powder, salt, pepper, etc. - and rub them on a flank steak. Place the steak in the bottom of your crock pot, put chopped onion, bell pepper, and jalapeno on top, and cook it for 8 hours. After 8 hours, you take the steak out, shred it with two forks, and return it to the crockpot. You can either serve it then or keep it warm in the crock pot until you're ready to eat. 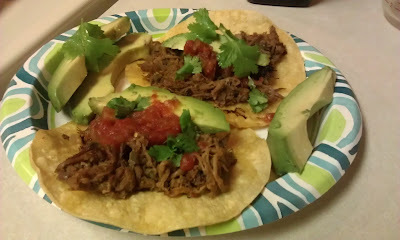 Serve with corn tortillas, salsa, avocado, cilantro and lime. Mix together all spices in a small bowl. Place steak in the bottom of your crock pot and rub the spices all over your flank steak. After 8 hours, remove meat from crock pot, shred with two forks, and return to crock pot. You can either serve as is or keep the shredded meat warm in the crock pot until you're ready to eat. To serve, heat your corn tortillas in a skillet on the stove. 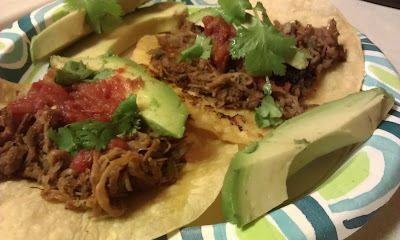 Spoon some carnitas on a tortilla then top with salsa, avocado, cilantro and a squeeze of lime. You can prepare this the day before - rub the spices on the steak, chop the onion and peppers, and throw everything into the crock pot. Then it's easy to just pull it out of the fridge the next morning and start it cooking. Another option is to prepare everything, let it cook overnight, and then it's ready to shred when you get up in the morning. Also, your house will smell amazing when you get up. The meat is seasoned so nicely and is even good cold, but the leftovers also heat up nicely. I put enough meat for two tacos into one half of a large skillet and two corn tortillas in the other side and heat on medium heat until the meat is warmed through and the tortillas are warm. The first time I made this, I followed the recipe, using 1 green pepper, 1 red pepper, and 1 jalapeno. The second time I just pulled some diced green peppers out of the fridge and didn't worry about the red one. I don't even know how many peppers I had diced - just put the onion, frozen green peppers, several pieces of frozen hot peppers, and a clove of garlic into my food processor and chopped them up good. It turned out really good.